Need Free Help with Memory Improvement? You've Come to the Right Place! Do you need some help with memory improvement? 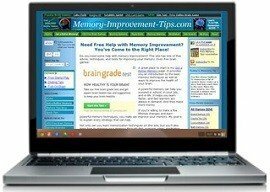 This site has lots of free advice, techniques, and tools for improving your memory. Even hundreds of free online brain games! A great place to start is my Get a Better Memory page. It provides you an introduction to the best memory techniques as well as ways to improve the health of your brain. A powerful memory can help you succeed in school, in your job, and in life. It helps you learn faster, and fast learners are always in demand. And they make more money. If you're willing to make a few lifestyle changes and learn powerful memory techniques, you really can improve your memory. My goal is to explain every strategy that can help. Not only can you learn memorization techniques on this site, but you'll also learn how to improve your memory through diet, exercise, sleep, meditation, and other ways. Plus, I'll point out other tools and resources along the way that you may find helpful. Be sure to stay up-to-date with changes and additions to this site by subscribing to my Memory Tips blog. I'm continually adding new information and resources to help give you a more powerful brain. Memory improvement can be achieved in two ways: 1) by improving the health of your brain, and 2) using memory skills. These are easier to do than you might think, but you have to make the effort. This website provides you with lots of strategies, advice, and tools that can help you get a better memory. There is no single road to improving your memory. That means it's important to include many different brain enhancing habits in your daily routine. Memory improvement shouldn't be a burden, but it does require a little time and effort on your part. Of course, I would argue that a more powerful brain is well worth the effort! Brain Games Training. Keeping your memory sharp can be fun. There are over 250 free online brain games on this site you can play anytime. These games improve memory, attention, concentration, and more. I've even added a free version of Dual N-Back, the only brain game proven to raise IQ! No registering, no loggin in. Just go to the game page and start playing. Memory Techniques. The Memory Systems, a group of memory techniques based on visualization, is the real miracle that most people have never heard of. A quick example: To memorize that "Atlanta" is the capital of Georgia, imagine an ant landing on George Washington's head. "Ant Land On + George" = Atlanta, Georgia! These visualization methods can be used to memorize lists, vocabulary, reading material, people's names, math formulas, or any other type of information. Proven Study Methods. Memory techniques are only part of the learning puzzle. To learn even faster and remember more, use the best study skills. These proven methods help students of all ages remember better. Maybe It's a Sleep Problem... It's amazing how poor sleep can hurt your memory. If you have trouble sleeping at night or simply are not getting enough hours of sleep, it could be causing your memory problems. Check out the Sleep and Memory page for great tips on getting more sleep and better sleep. Fish Oil - The New Memory Fix. Do you or someone you know have problems concentrating? An Omega-3 deficiency sometimes causes this problem, because modern diets often don't provide enough of this nutrient. In one study in Britain, school children with poor concentration and memory who received Fish Oil vitamins showed a big improvement in behavior and school performance. Read more about the many benefits of fish oil supplements. Grow New Brain Cells. Amazingly, it is possible to grow new brain cells (neurons) in the memory center of your brain. According to research, intense aerobic exercise (such as running, biking, etc.) stimulates the growth of cells in the brain's hippocampus. As you can see from the partial list above, there are many different ways you can begin to build a stronger memory. Click the blue buttons along the left side of this page, or go straight to my Get a Better Memory page for a detailed list of memory improvement tips steps. You don't have to be satisfied with a poor memory. Don't accept that you can't remember things. Instead, do something about it! Become that fast learner who enjoys all the success. Don't forget to sign up for my free "Memory Tips" email newsletter. Once a month, I'll send you powerful tips and trick for improving your memory and brainpower. The newsletter is delivered right to your email in-box, and it is completely free. To sign up, use the form below. Or, visit the newsletter subscription page for more information. I promise to never share your email address with anyone, and you can unsubscribe anytime. It's my goal to help as many people as possible improve their memory. So if you like my Memory Improvement Tips website, please let others know through Facebook, Twitter, Google+, and other social networks.